The idea might not make much sense from a listener’s perspective. But, you wouldn’t forfeit it, so you create reasons and justifications nimbly to make them buy your idea. The intuitive confidence you have in your idea will drive you to convince your fellow peers. It greatly depends on the listener’s intellectual and your conversation will get more convincing and stronger proportional to your peer’s intellect. But, somehow it still fails eventually. An idea is like a raw meat and you are not supposed to serve it raw. Given the right amount of condiments and seasoning, an idea will turn delicious. The idea by itself must be simple but, the more bells and whistles you add to it, the better it becomes. At the moment your peer raised question your intention turned choking the raw meat to them rather serving it delicious. How to get rid of this and make the idea successful? Every idea has four components akin to a planet. 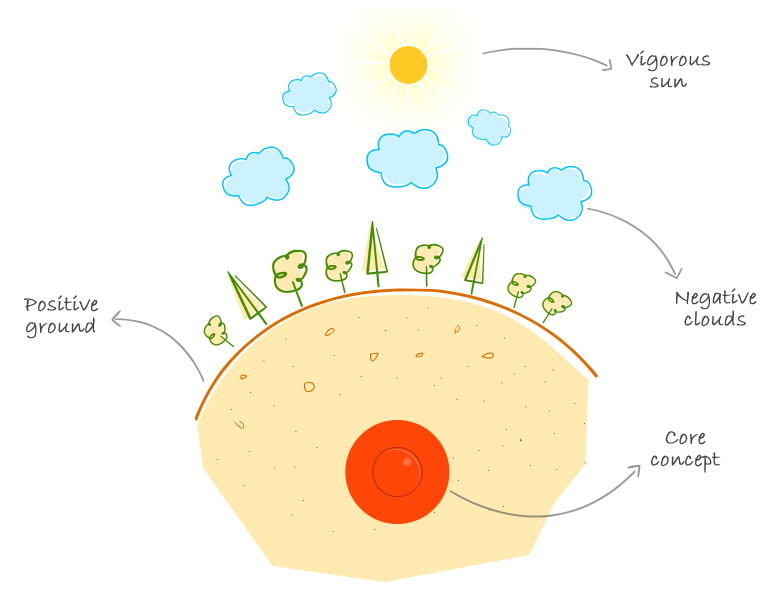 They are Core concept, Positive ground, Negative clouds and Vigorous sun. This is the best analogy I could come up with. Pardon me! Turning your intuitive concept into something organic and working is almost similar to how a planet becomes habitable for the living things to evolve. Your mission is to make the planet sustainable and happier to live in. Core concept, as the name suggests, is your core intuitive idea from where the planet gets created. It supplies warmth, nourishment through soil that enriches the living species over the ground. More unique your concept is, the more sustainable, different and habitable the planet will be. Even when the concept is based on your notion, a research wouldn’t hurt. Shape the concept firm, make it sensible and indestructible. An ambiguous concept is like a planet made out of clinker which is easy to crumble at any time. Positive ground is filled with practical possibilities and rational thinking around the core concept. Piling all your doubts and finding solution raises the positive ground. It greatly depends on your ability to introspect and brainstorm. A thicker positive ground results in a sustainable and secure core. Planning for the future is an important step while dealing with the positive ground. Always think solutions from a bird’s-eye view. What will happen tomorrow? What will happen the day after? This will make the ground not only sustainable for today, but also for the forthcoming days. Negative clouds are the shades of doubts, questions or criticism from your audience on the planet. More the shadow from clouds, the less will be the potent of your positive ground as the clouds hinder the sunshine. Deal with the clouds as you go and never take it for granted. More you deal with the clouds, more the rain on your planet. The rain helps you correct your positive ground accordingly. It makes the ground gain traction and grow into something bigger than you previously imagined. Vigorous sun, of course, is the impetus of the planet. It completely depends on what your idea is based upon. Sunlight is mandatory for living. Deploy your valuables on the planet to make the most out of it. More the efficiency of sunlight, more prosperous the planet is. How you perceive the sun does matter. The sun is analogous to an investor, if your idea is about a startup. In case of a passion driven idea, the sun will be the happiness. If based on love, the sun is the peace. NOTE: Alien disruptions are not considered! Designer and Product Thinker @ideas2it.